According to the Alzheimer’s Association, people diagnosed with memory diseases can live in their home as long as they are within a safe environment. Due to the progression of Alzheimer’s, a person’s judgement, behavior, sense of time and place, and physical ability are hindered. Tasks such as setting the table, cooking, or cleaning, can not only be challenging but dangerous. Follow the tips below to create a safe and comfortable home while keeping their limitations in mind. It’s very important to conduct a walk through of the home with a notepad and pen, and write down all the areas that need attention. Take the following into consideration. Declutter- Make sure each room in the home is clear of clutter to avoid trips and falls. Lit Halls or Walkways– Vision deficits not only affects the elderly, but also someone with Alzheimer’s. Keeping hallways lit with a “night light” will help the person maneuver around their home much easier, especially when using a walker. Garage/Basement- Gather all items that can be hazardous such as power tools, lawn mowers, and weed trimmers. Be sure to keep them locked away and consider having a family member take over yard work. Assess Locks- Wandering can be a problem for those with Alzheimer’s disease. Consider installing a deadbolt with an extra key to prevent wandering. For all outside doors, use the same key so there is no confusion of multiple keys for multiple doors. Remove locks from inside doors, bathrooms and bedrooms, to prevent the possibility of getting locked in from the inside. Cooking may be a favorite activity for some with Alzheimer’s. To keep them as independent as possible, while keeping them safe, make sure to identify any cutlery or utensils that could be dangerous. Replace these with easier to use tools. Special Cutlery– Switch knives for special cutlery that have a rubber grip. These not only allow for the person to hold the handle better, but also prevents cuts. Although all rooms throughout the home are important, the bathroom can be very dangerous, especially if there is a walker involved. Grab Bars- Add grab bars close to the toilet, within the shower, and by the sink. Any place that the senior may experience dizziness or lightheadedness is a good place to mount a grab bar, not just in the bathroom. Walk-In Showers- It is very common and dangerous for a slip and fall accident to occur getting in and out of the bathtub. To avoid this, consider renovating a traditional bath tub with a shower head, into a walk-in shower. This way, it’s easier for them to get in and out of the shower accident free. 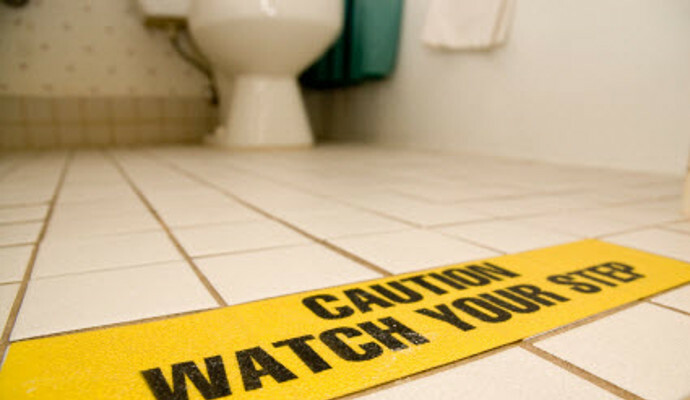 Texture to Floor– Adding textured stickers to the floor is a great idea to prevent slips and falls. Preparing your senior in case of an emergency or evacuation is reassuring for you, your senior, and the family. Emergency Contacts– Keep an updated list of emergency contacts for doctors, pharmacies, or to take with you during an evacuation. Medication List– Keep an updated list of medications with instructions. Make sure to include the contact of their primary doctor and any other specialists that is involved with your senior. Remove Weapons– These can be harmful to the senior or anyone around them. With the possibility of mood swings and agitation with Alzheimer’s, Its best to remove weapons from the home, so there is no possibility of an accident. With a little preparation and attention, both you and your senior can have a safe and secure living environment.